Heather Headley in "The Bodyguard". Photo by Paul Coltas. Regal. That’s the word most people associate with Tony and Grammy winner Heather Headley. And who can blame them when you consider her graceful beauty and her commanding voice, not to mention her star-making Broadway roles as a Nala in The Lion King, and the titular royal in exile of Aida. But to those who know her, and I consider myself lucky enough to have spent some personal time with her as a fellow alumni of Northwestern University, she is also a wickedly funny friend, a loving wife to her college sweetheart (former New York Jet Brian Musso) and a devoted mom. After too long an absence from the theatrical stage, she is making her long-awaited return in the West End adaptation of The Bodyguard. The musical features a hit parade of songs made famous by the original film’s star, Whitney Houston — including “Queen of the Night.” Taking a few moments from her busy schedule, we exchanged emails (emoticons and all!) to talk about making the role her own (The Telegraph called it “a thrilling star performance,”) her toughest times and her dreams of coming back to the New York stage. Many of us hoped we’d see you in a musical on stage again. What about The Bodyguard made it the right property for your “return”? The story. The music. The girl. For the past few years we (my husband and I, and my agent) have been looking for the “right” role. 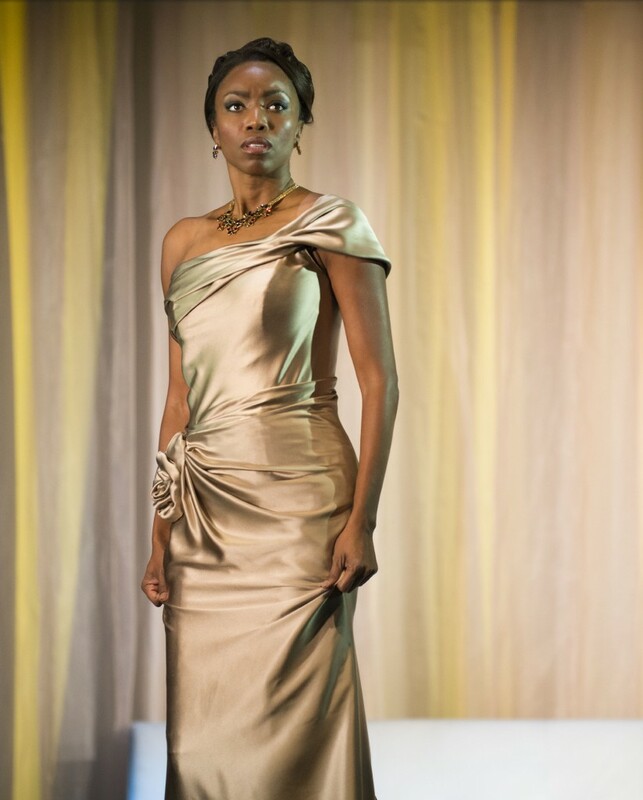 Aida was very good to me; I had such an amazing time playing her, and being a member of that cast. So, I really was on the lookout for a role that would at least come close. I read through the script of The Bodyguard, and loved the story and the characters. Rachel is a lot like Aida: flawed, obstinate, needs and longs to be loved, and when she finally finds love, loses quite a bit and has an amazing change in her life. Who doesn’t want to play that girl?! Was there a particular song of Whitney Houston’s that you sing in The Bodyguard that intimidated you, either because of memories of her original version or the songwriting itself? How did you approach performing that song given your “fears”? There are a few (smiles)! “I Have Nothing.” It’s a beast and it’s tough to sing because it covers quite a range. As with all of Whitney’s hits, it’s also very well known, so I always want to get it right. And then there’s the big one: “I Will Always Love You.” It’s like the “Nessun Dorma” of pop music and needless to say, from the first note… you just have expectations. So, I’m always making sure that I can do that one well. I’m not expected to be Whitney—no one can be—but I do want to do it justice every time I have the opportunity to sing it. Concerning my “fears:” I decided that I would stop listening to Whitney. Not that it helped—I’ve listened to her since I was a child, so she’s still in my head. But I thought that I needed to find the songs in my own voice, and when I hear her it’s just an intimidating reminder of the greatness of her voice. She really had one of the most beautiful voices we were ever given the pleasure of hearing. 8 show weeks are demanding. 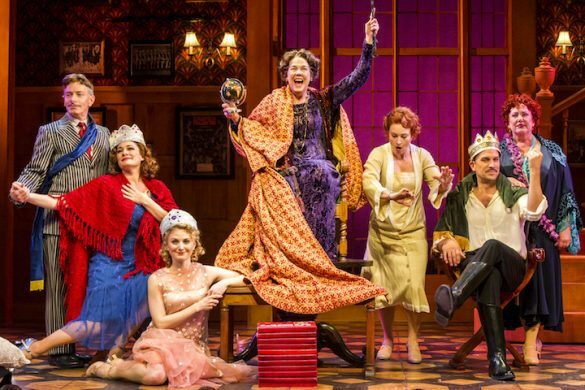 Given that you are much more experienced, not to mention a wife and mother, how is the stage experience different than when you were first on Broadway? Actually I perform six shows a week with the wonderful Gloria Onitiri (my alternate) performing the other two, but oh my! I forgot how demanding it was trying to manage and maintain the health of my voice and body, the show, life and then be a wife and mommy—not to mention being… um… more experienced. It can be tough but the experience is still a wonderful one. I still get nervous, and I’m still in awe of the audiences and their kindness and appreciation. I’m still so humbled that I can do this for a living. I walk off the stage tired but my mind is invigorated. Heather Headley's Grammy-Winning "Audience of One". Image via Google. I know you’ve travelled a lot for your concert work but what is it like to sit down overseas in London for a long stay? How is it affecting your family? Is there one thing you miss most about Chicago? Something unexpected that you’ve discovered you love in London? London is a beautiful city. You couldn’t ask to “sit” in a better place; it really is an amazing city. I do miss the concert work at times—especially the days off between shows ;-). My husband has been commuting back and forth, and that has been the toughest part of this adventure. My son (who is with me) and I miss him terribly when he’s gone. But I think we’ve grown even closer through this experience. He encouraged me to do this show, and I’m grateful for his trust and belief in me—the fact that he would sacrifice like this for me…for us, is overwhelming. I truly feel, and know that I’m loved. Our son is really doing well. We have an amazing woman who came here to help me with him, and she has been an invaluable help to us all. I do miss American food. Oh, how I miss the food! Don’t tell the Brits, but I still haven’t fallen for their food. England has had quite a few hundred years to perfect her city, and she has done an amazing job. It’s just beautiful. There are days that I think if I close my eyes, I can hear the trot of horses, and see men in their hats and overcoats, and women in their floor length dresses. Every corner seems to present another piece of history and it’s just a wonderful town to explore—even if it’s just the trips to and from the theater. So I do love coming around the corner (for want of a better expressionJ). I’ve always been curious about your arrival in Fort Wayne from Trinidad; what was that transition like for you? How did it influence your desire to act and sing? How does it influence your career today? It was tough for a few years. I came to the States when I was 15-years-old. All I knew was left in Trinidad. We arrived here in October, so even the weather was a shock. But I am so grateful for all America has given to my entire family. I was already performing in Trinidad (that’s where I learned that I could), but coming to the States solidified it for me. I’m so grateful for this amazing journey that God has allowed me to have. 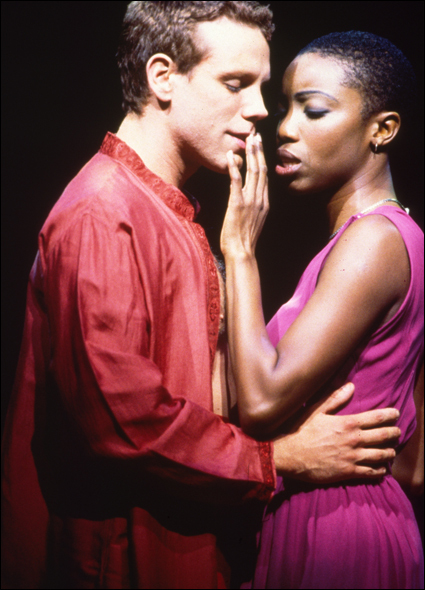 Adam Pascall and Heather Headley in "Aida". Photo by Joan Marcus. As a fellow Northwestern Wildcat, I have to ask about when you decided to leave school to join the company of Ragtime. That must have been intense. Who did you turn to for advice during such a life changing crossroads and do you remember what they said? Was there ever something you missed about not being with your classmates that Senior year? What was it like that first day of rehearsals in such a huge production? Oh my! That was one of the toughest summers of my life. I was ready to stay home; I had no intention of going to Toronto, but as the news got around, everyone called and told me I would be an idiot if I didn’t go! My mother and I came to a decision that we would ask every respected person we could, and if we heard one NO from any of them, I’d stay home. Dominic Missimi, Dr. Robert Harris, Janet Louer and Harrisse Davidson (my agents at the time), friends, high school teachers, all said to go. So I did! And I’m grateful I did. My last day of my junior year I got Ragtime, a Christmas show in Chicago (had to say no to them), and a few of the football players (Brian was one of the group) invited me to dinner. It was a good day. I missed doing the shows with my fellow seniors. I missed graduation and singing “To The Memories.” I missed going to the football games and finally understanding what was going on, not to mention actually enjoying them because the team WAS GOOD! But it all worked out for the best… and in the end, the whole football thing worked out too. I’ve had quite a few dinners with the hottest player on the team since then ;)! It was crazy! I was still reeling that I had LEFT SCHOOL! I was nervous and scared and wondering when they’d pack me up and send me back to school… but praise God, I didn’t really know the full extent of the amazing-ness in the room. What a cast! What an awesome schooling for me. With all due respect to NU, I’m not sure the classroom could have taught me as much as I learned from watching Marin, Brian Stokes, Audra, Peter, and the rest of that cast. Finally, if we get lucky enough to see you transfer with The Bodyguard to New York, what about the Broadway experience and/or the Broadway community have you missed the most? There’s no place like Broadway… They are the biggest critics (because they’ve seen it all), but once they love and accept your show, it’s the most encouraging and wonderful place you can be. I’m excited to come back, and introduce the show to everyone, and I do hope that they will love it as much as the audiences and I do. I’m hoping I’ll be able to keep it together the first night (and every other night) that curtain goes up, and I hear that excited buzz go into silence. Can’t wait. 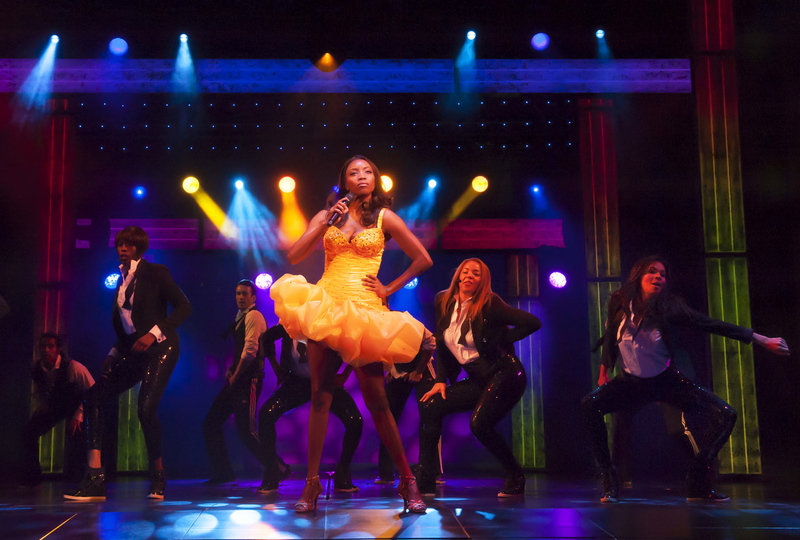 The Bodyguard is currently booking at the Adelphi Theatre, Strand, London WC2 (0844 579 0094) until 28 September 2013. For more information visit thebodyguardmusical.com.